The ICFAI University, Mizoram has been notified by the UGC, under Section 2(f) of the UGC Act, 1956 vide Notification No.F.9-16/2007 (CPP-I), dated November 4, 2009. The University is competent to award the Degrees, as specified by the UGC under Section 22 of the UGC Act, 1956. 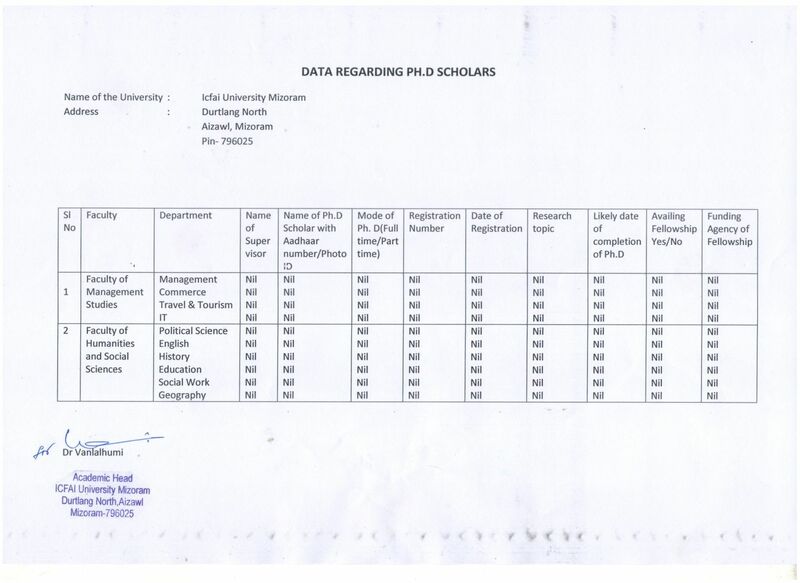 The ICFAI University Mizoram has received a provisional recognition of the Distance Education Bureau of the UGC for offering programs of the University through distance mode vide letter No. F .DEC/Miz/ICFAI/08 Dated 03-11-2008. The ICFAI University Mizoram has submitted an application for membership in Association of Indian Universities (AIU), India. The ICFAI University Mizoram is a member of the Association of Commonwealth Universities (ACU). ICFAI University Mizoram has patnered with Spoken Tutorials, IIT Bombay which is National Mission on Education through Information Communication Technology (NMEICT), a Govt. of India initiative. This is to enhance the skill set of both UG and PG students, and to promote and enable this ICT effort in all it's departments. Like any UGC recognized Degrees of any University in India, students passing out from The ICFAI University Mizoram are eligible to appear for examinations like GATE, CAT, UPSC, GMAT, GRE, JRF etc. Eligibility for CAT is a Bachelor Degree with at least 50% marks from a University established by Central or State Act. As The ICFAI University Mizoram is a University established by the Act passed by the State Government, students are eligible for CAT and every year students of The ICFAI University Mizoram participate in the CAT Examination. For GATE (Graduate Aptitude Test in Engineering Examination) conducted by IITs in India, Many students of The ICFAI University Mizoram take part in this examination every year.